Using credit cards, responsibly, can actually help your financial situation. There is a school of thought that cash should be king, credit cards can only lead to poor choices and debt, I am not in that school. I rarely carry cash and have used credit cards as a vehicle to make a little money for years. Here are 4 Ways to Save Money with Credit Cards. Before you dive in and start reaping rewards, remember these key points, this is so important! Use credit responsibly. Every time you open or close a card, your credit score is affected. Understand your credit score and how it is used. If you plan to finance anything in the near future stay away from opening a new card. Do not let a credit card change your spending habits. Just because you got approved for $5,000 does not mean you have $5,000 to spend. You still have to pay your bill every month. Pay you balance in full every month (with exception of #4 below). Use credit like cash and you will be able to reap the rewards without accumulating debt. If you have to pay interest on a card, that will usually negate any perk being offered. If you are comfortable with the above, let’s start saving some money! To find a specific card, check out Credit Karma and sort through the options. 1. Rewards Cards. There are many cards out there that offer some type of reward when you use your card. Some are very straight forward, 2% back on every purchase. Some change quarterly; 5% back on groceries one quarter and 5% back on entertainment the next. Find a card that will give you the best return. A basic 2% rewards card may be the best option, but if you travel for work maybe a fuel rewards card is the way to go. 2. Discounts. Often times discounts come with store credit cards (think Kohl’s, Gap etc). You receive special offers or discounts when you use your card. Find a store you shop at often and open their card to reap the benefits. 3. Travel. Want to take a vacation but don’t have a lot of disposable income? Get yourself a travel rewards card. You can find one that offers miles for air travel, hotels and rental cars. You can also find cards that offer discounts on destinations. If you are certain you can practice my 3 key points above, you may want to look into travel hacking; free travel through the smart use of credit cards. The best source for information on this is a collaborative project between 2 awesome bloggers called Travel Miles 101. 4. Consolidate Debt. This is the one point where it is ok to not pay your monthly balance in full, for a few months. There are certain situations where you may be able to transfer a loan to a credit card. Do this only if you can find a 0% card for a period long enough for you to pay off the loan. If you have a smaller loan you know you can pay off in 6 months, transfer it over and stop paying interest. Be sure you can pay it off within the promotional period or you may be stuck paying a much higher interest rate than your original loan. Remember, be responsible, don’t carry a balance, and treat credit cards like cash. These tips will help you save money with credit cards. 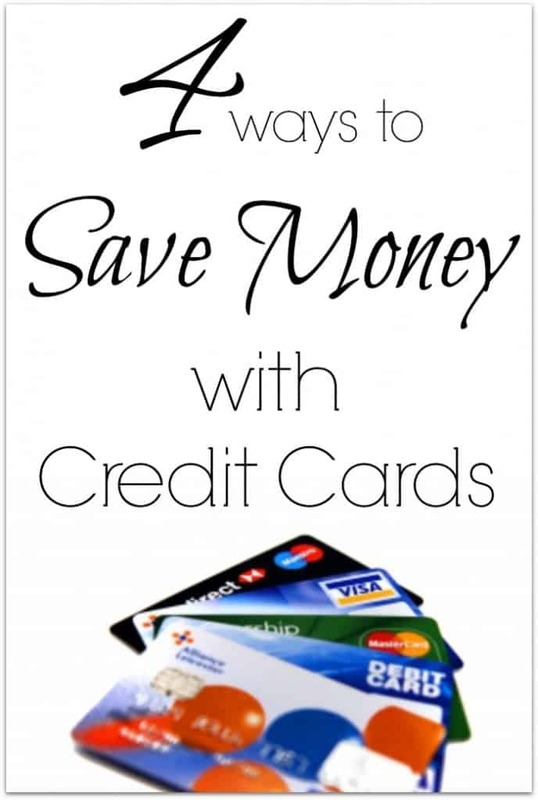 What’s your favorite way to save with credit cards? I’d love to hear about your deals. My Dad has a travel rewards card he uses for his drywall business so he gets tons of free airline points! it really does make sense to get a reward card if you are using it responsibly! That is the way to go, how fun! And yes responsibility is key. Thanks for stopping by and reading Krista. My husband took your course and loved it, he has been sharing with me and we are putting it to good use!